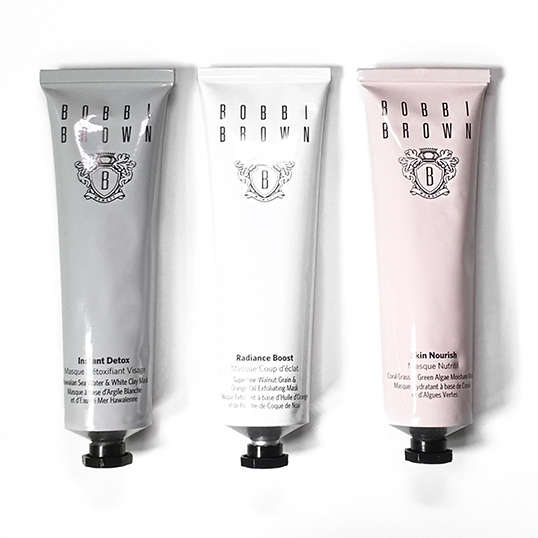 I'd been anticipating the January launch of Bobbi Brown Beauty-Boosting Face Masks, and despite my many trips to the BB counter in Amsterdam was left empty-handed and wondering, what's all the hype? I practically had butterflies when I saw them on display in Harrods a few weeks ago. Yes, I'm that ridiculous! 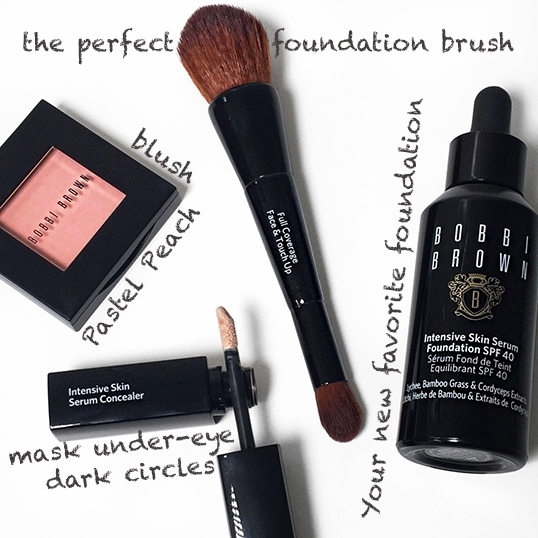 Lets 'face' it, every product Bobbi Brown releases is great - you can't go wrong with this premiere cosmetic line. It's no surprise that I purchased all three masks. I would have purchased the mini's too, but they didn't have them (insert sad face). I'm branding these masks - The Miraculous Makeover Mask Trio. Instant Detox, Radiance Boost and Skin Nourish can be used together or individually to address your specific needs. I have overdosed on all three and love the results. The Instant Detox is my favorite. This clay-based mask is creamy, has a refreshing citrus scent and kinda cools your skin while you detox. Hawaiian Sea Salt Water and Amazonian White Clay work together to remove impurities, reduce pore size and maintain moisture. This mask will leave you feeling refreshed and super clean. The Instant Detox deep cleanse removes excess oil, tightens my skin and my complexion looks AMAZING! 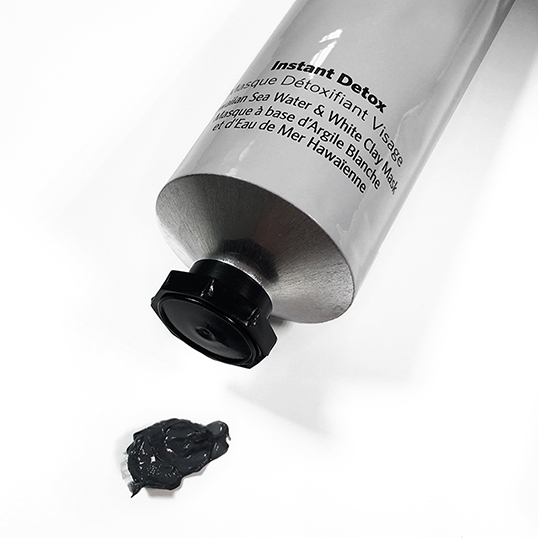 I use the Instant Detox in the center of my forehead, down my nose, on my cheeks and chin. At the same time, I apply the Skin Nourish around my eye area (not too close to the eye), around the edges of my nose (where it gets super dry and flaky), and around my eyebrows (they're dry from Browfood - a hair growth treatment). Combined, these masks address both my skin issues at once. This deep cleanse/nourishing treatment is my favorite facial pick-me-up. I also use the Skin Nourish twice a week before bed. 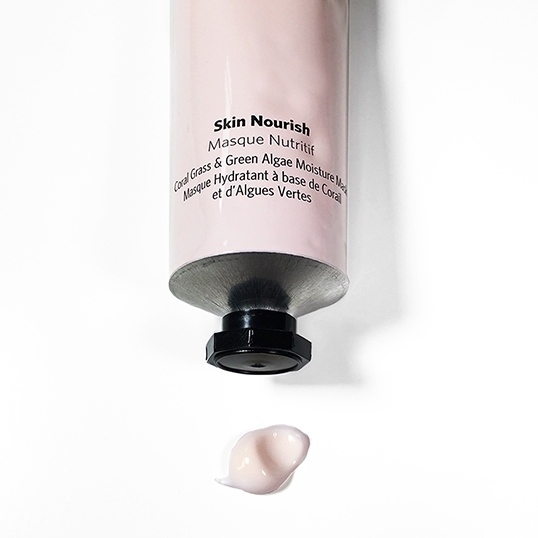 This super-moisturizing mask contains hydrating herbs Coral Grass, Salicornia, and Trehalose, Collagen producing Chlorella Extract, and Muru Muru Butter to repair your skin's natural moisture barrier. This lightweight mask is creamy, the scent is calming, and I love a mask that you can leave-on throughout the night. Apply liberally and wait two-five minutes. Then gently remove the excess product and massage the remaining onto your skin. In the morning you will have plump smooth, nourished skin. The superfine Walnut Grain Beads in Radiance Boost, gently exfoliate your skin and improve circulation. 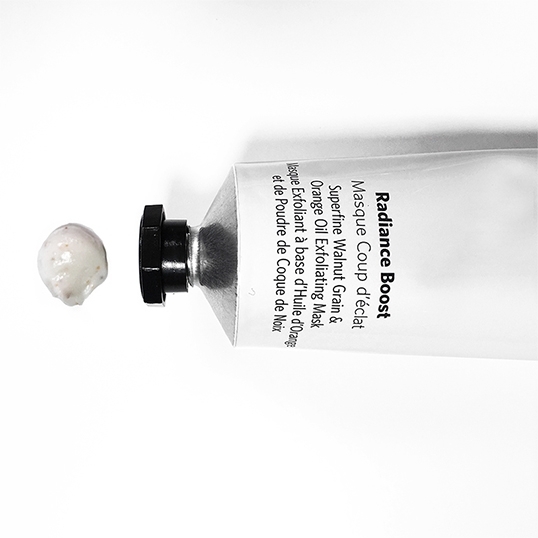 While the Kaolin Clay reduces oil, Algae Extract and Sodium Hyaluronate moisturize your skin, and Orange Oil energizes. I have Rosacea, and very sensitive skin, so I'm not surprised that this gentle exfoliator causes my forehead, nose and cheeks to turn red. Once the redness diminishes, my skin feels super-tight (I like that), and my complexion is brighter. The orange scent is invigorating - I'm partial to citrus scents in facial care cosmetics. Directions: Instant Detox can be used once a week (or two if necessary). Apply, allow two-five minutes to pass and remove with warm water. Skin Nourish can be used three times a week. Apply, wait two-five minutes, gently remove access and leave remaining product for overnight nourishing. Radiance Boost can be used once a week (or two if necessary). Apply, let it sit for two-five minutes and rinse off with warm water while gently massaging in circular motions. The application of these masks is quick, but the results last. I should mention that the packaging is great. The metal-like tubes are flexible and you can roll them up, allowing you to get as much product out as possible. I have been protesting foundation for years and instead focused on blemish free, healthy skin. Laser treatments, topical medication and anti-aging creams replace my need for layers of makeup and my skin looks great (for the most part). I'm also a no-makeup makeup kinda girl and while I appreciate cheek and lip color, thick lashes and a heavy brow, I'm not focused on a 'perfect' complexion. Until.. I was feeling drab one day and happened to be near a Bobbi Brown counter (never makeup shop when you're feeling down). Bobbi Brown Intensive Skin Serum Foundation and Intensive Skin Serum Concealer were on display and of course the Bobbi Brown consultant was happy to sample the products for me. I wasn't completely sold on the effect, mostly because I don't like having makeup applied over my own. I asked for a sample to try at home, just in case I didn't like the color or overall look and wanted to return the unopened bottle. This foundation moved to the top of my 'must have' beauty product list after just one application. My skin was glowing, looked fresh and appeared natural. I applied a thin layer of the concealer over my Bobbi Brown tinted eye-brightner and the combination worked great to cover my dark circles and even out my under eye area. These lightweight serums will brighten your skin, even out your complexion and give you a natural medium coverage. I highly recommend purchasing the Bobbi Brown Full Coverage Face & Touchup brush. The soft bristles blend these serums onto your skin seamlessly. Apply a small amount of foundation on the back of your hand and from there small amounts onto the larger end of the brush. In circular motions, apply the foundation starting on your nose and working your way outwards towards your hair line. You don't need a lot of product for the intended medium coverage. Use the small end of the brush to blend the Intensive Skin Serum Concealer under your eyes. For a hint of color and fresh look, Bobbi Brown blush in Pastel Peach is subtle and pretty. Apply to the apples of your cheeks, a little down your nose, across your forehead and a dab on your chin for a healthy glow.